This Friday, before the Rooftop Concert and the gallery stroll, a strange and marvelous thing will happen in Provo for the first time ever: a dance walk. It goes without saying that this will be fun, unusual, and a way to get to know other people in the community. * I’d also add that this is a great way to see Provo from a different angle; traveling through the city in different ways will emphasize different parts of buildings, streets, and people. Most people have probably never dance walked anywhere before, so everyone is bound to see Provo in a different light. * Though I initially thought this event might help me overcome my lifelong fear of dancing in public, I sadly will be working when it happens. So please go and let me know how it is. I saw the Echo’s first production, The Woman in Black, and really enjoyed it, so I have high expectations for this latest play. I also don’t need to mention how projects like this improve the entire city. Tickets are available online or at the door. The show runs until June 16. 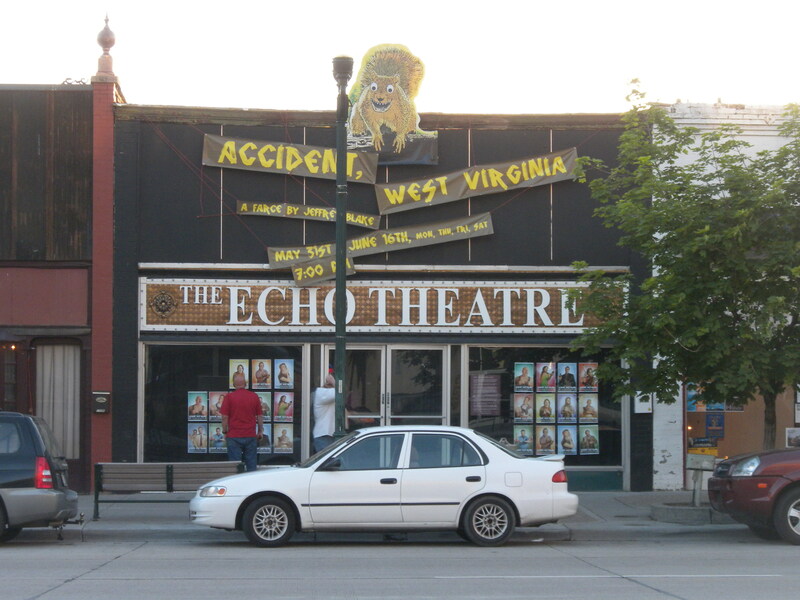 The Echo Theatre will present Accident West Virginia beginning Thursday. Provo is on a roll. There’s lots of new development, projected population growth, and a general air of excitement and possibility. But Provo has ebbed and flowed in the past; how can the city make sure the good times keep coming, rather than drying up in another boom and bust cycle? I don’t mince words when I say that communities that invest large sums of public money in mega-projects like sports arenas, convention centers, and massive new digs for the “SOBs” – the symphony, opera, and ballet – are sorely mistaken if they suppose this will somehow lead to economic growth and development. The key mechanism at work here is the city itself. Dense and interactive connectors, cities are economic and social organizing machines. They bring people and ideas together, providing the platform for them to combine and recombine in myriad ways, spurring both artistic and cultural creativity and technological innovation, entrepreneurship, and economic growth. In any case, Florida is basically telling cities like Provo how to prosper over the longterm. His conclusion is supported by a mountain of evidence and research — which is cited almost daily on this blog. It just remains to be seen if city leaders and citizens will be able to cut against the inherited wisdom and implement these ideas. 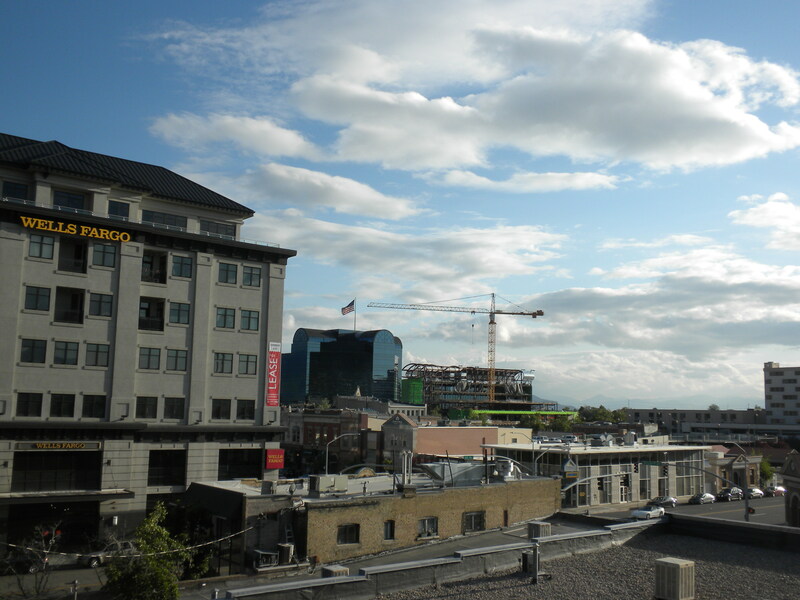 If Provo wants to sustain the current level of investment and excitment, it needs to invest in increasing density and spurring creativity. A new month is upon us and it’s time again for the Rooftop Concert Series. 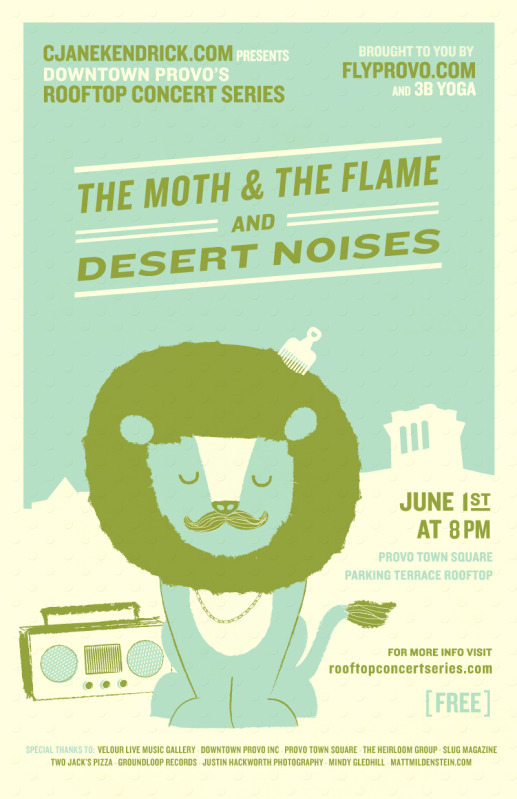 This Friday, The Moth and the Flame and Desert Noises will both play atop the parking garage of Provo Town Square. As always, it’s free and starts around 8 pm. Today, the Rooftop people also released this fantastic guide to the show. This month’s show also is exciting because Communal will be out selling food. According to the restaurant’s Facebook page, they’ll be offering “some special items for sale throughout the entire show.” Last month, I ate the street tacos from Mountain West Burrito — which is owned by the Communal people — and they were fantastic, so I can’t wait to see what they have in store this time around. Black Sheep Cafe also wrote on their Facebook page that they’ll be selling food, and the show guide mentions that the south alley will become a “food market.” That sounds like a great development. From this relatively modest in­­vestment in public art the project received more publicity, more public recognition, and more leasing interest than from any other element of the entire budget. The murals became a marketing bonanza. The private marketing benefits, in real-dollar terms, of this modest public art investment are almost inestimably high. The continuing visibility, publicity, and brand identification that public art provided for the project were purchased for less than one-tenth of 1 percent of the project’s total cost. Investments in public art are not just for cultural or aesthetic purposes; they also can have a positive bottom-line economic impact, with material financial benefits to their owners. Good art is good business. This is a topic that comes up frequently on this blog, in large part because I consistently hear people describe the arts as nice but not necessary. As these examples in LA demonstrate, however, art is one of the most necessary parts of a successful city. I mentioned yesterday that I visited Springdale over Memorial Day weekend. Like pretty much everyone who visits Springdale, I was there to see to Zion National Park, the entrance of which is just a short walk from the city’s downtown. The visit to both the park and the city was enjoyable, and emphasized to me the massive economic benefit of outdoors activity. I know that not every weekend in Springdale is as busy as Memorial Day, but regardless, the entire town economy is basically built on tourism. 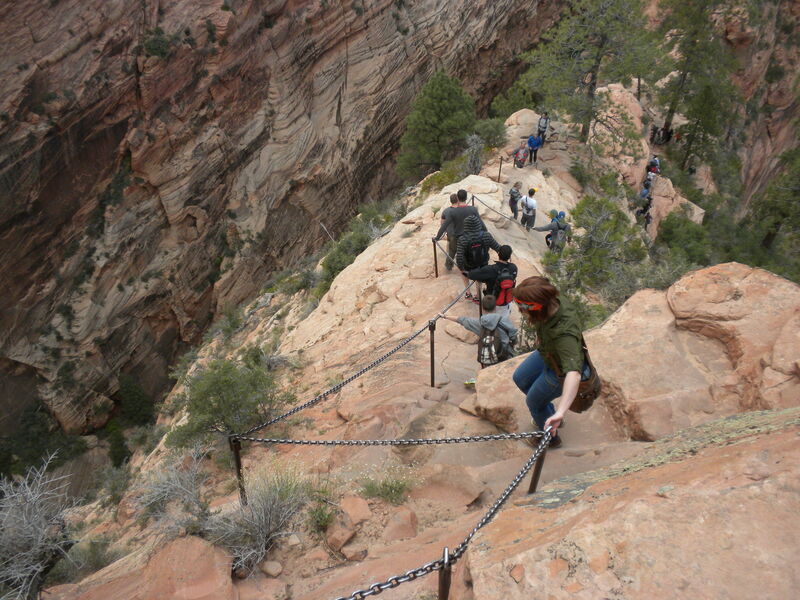 Zion National Park is filled with tourists on busy weekends. Those tourists also support the economy of the nearby town of Springdale. Provo isn’t Springdale and the surrounding mountains aren’t Zion National Park. But Provo does have incredible outdoors opportunities. For people coming into the city from flatter, or simply less striking environments, those opportunities can seem much closer in caliber to Zion than locals might realize. I know, for example, that when I arrived in Provo I was constantly struck by the suddenness of the east mountains. That effect gradually wore off, but I’m reminded of it when I’m working in court and hear out-of-towners comment on the beauty of the surrounding landscape. The point is that Provo could have a stronger outdoor tourism economy. Places like Rock Canyon, Provo Canyon, Utah Lake and Deer Creek Reservoir, Timpanogos, etc. all should be major attractions for locals and for tourists. Smaller hikes like Stewart Falls, or sites like Cascade Springs similarly could be part of Provo’s brand. Unlike places like Springdale, Moab, or Park City, tourism doesn’t have to sustain the entire local economy in Provo. Thanks to BYU and Nu Skin, tourism also already happens in the city. But the mountains and the lakes are a vast economic resource — among many other, less tangible things — that are only barely being tapped. Provo’s mountains are striking, beautiful and filled with good hiking trails. But Provo still attracts significantly less outdoors tourism than other Utah cities. We all hate traffic, but getting rid of it may mean doing something counterintuitive: adding people. At least, according to an Arizona Department of Transportation study, putting houses closer together cuts down on the amount of traffic. In other words, greater population density cuts down on traffic. Fine-grained street networks distributed traffic evenly across the higher-density neighborhoods, while every driver in the suburban neighborhoods was funneled onto the same big arterials. At the same time, improved pedestrian conditions in commercial centers made it easier for some drivers to park once and walk from destination to destination, taking cars off the road precisely in the areas that attract the most people. Significantly, the article also notes the need for a public awareness campaign. That’s something that’s desperately needed in Provo as well; though city leadership in Provo seems to generally appreciate this kind of information, they’re faced with running a city of people who have never been told anything except that density is dangerous. However, as this and many other studies point out, it’s quite the opposite.